The concert is on the eve of the retirement of West Church's minister, The Revd Ronnie Johnstone, on Saturday, 26th March, at 7:30pm. The choir is made up of students from the Royal Scottish Academy of Music & Drama, one of North Highland Connections cultural partners. The Choir was established in September 2007 by its present musical director Andrew Nunn. Les Sir�nes is a Chamber Choir consisting of 16 vocalists who are all students at the Royal Scottish Academy of Music and Drama in Glasgow. The Choir was Adult Choir of the day in the BBC Choir of the Year competition in Edinburgh in May 2010. They were also semi finalists in the Last Choir Standing competition in May 2008. 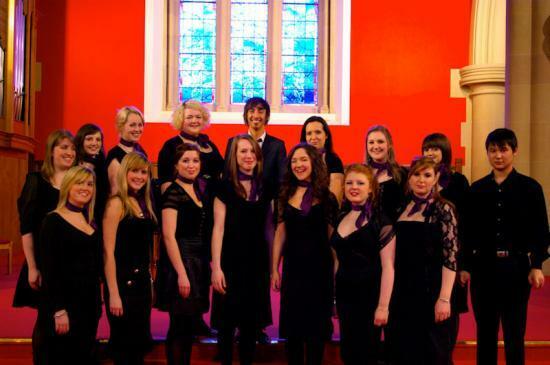 Since 2007 Les Sir�nes have been in great demand across Scotland and The Choir performs many concerts throughout the course of the year in prestigious venues such as Glasgow Cathedral, SECC Clyde Auditorium, Dunkeld Cathedral, Paisley Abbey, The Mackintosh Church, House of an Art Lover, Oran Mor, RSAMD Guinness Room and Concert Hall, Queens Hall Edinburgh, Glasgow Royal Concert Hall and Cadogan Hall London. The choir has given the premiere of two new works by composer Gareth Williams; "Discipline" in 2009 and "Gethsemane" in 2010. In 2008 The Choir collaborated with director Marilyn Imry in a performance of a play called "The Bones Boys" which was then broadcast on BBC Radio Scotland. They have also collaborated with renowned Scottish composer James Macmillan in a Church Service in 2010. In December 2009 members of Les Sir�nes performed with the orchestra of Scottish Opera in the 'Children's Classics' concerts in Glasgow and Edinburgh. "Wherever they perform or whatever the occasion may be Les Sir�nes is passionate about performance." Tickets will be available at the door on the evening of the concert, or they can be reserved by calling 01408-633964, or by e-mail: MF[AT]northhighlandconnections.org.